Well, it finally happened. My ancient pink Motorola Razr took a trip over the rainbow bridge last week, and was quickly upgraded to an Apple iPhone. 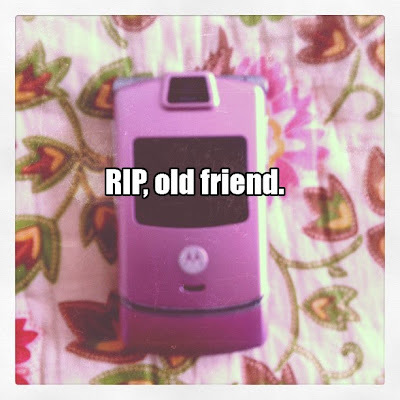 Razr, we had a lot of good times together, and I'll always look back on those memories fondly. Remember how excited I was when we first met? You were always there for me during those important phone calls, and even forgave me that time I was walking outside, got startled by a spider, and dropped you on your pretty pink head. Even when your back fell off last year and I taped you up, you kept on trucking, right up until the very end, when the simple act of sending a text message nearly drained your entire battery. Admittedly, it was a bit spiteful of you to leave me now since the iPhone 5 is coming out in just a few short months, but it's ok. I forgive you, and hope you don't take how quickly and enthusiastically you were replaced as a sign of disrespect. It's just that me and iPhone 4 hit it off right away, and it just gets along SO well with my other friends, especially my bestie: MacBook! Plus, I think you can appreciate that a phone that stop being manufactured in 2007 is not very app friendly, and as a blogger of cat culture, I have to stay up to date on these things. I mean, who else is going to report on the latest Talking Tom news, or inform the masses of the Kitty Wigs iPhone application? Yes, friends. That was just my long-winded way of saying, "I finally got an iPhone!" 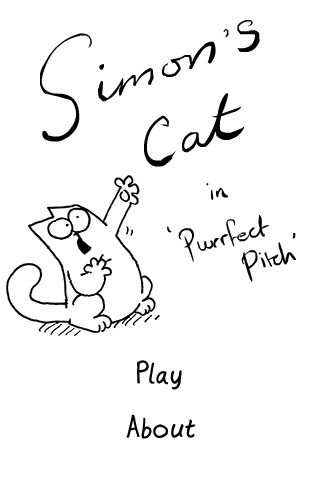 And with the way my brain operates, the first thought I had after the contract was signed was this: CAT APPS! There are, of course zillions on the market, and a cursory search of "cat" in the Apple app store produces an overwhelming, endless list that I cannot even to begin to explore on my own. So for our purposes, this list is mainly focused on the most popular, interesting, and (sometimes) free cat apps for your phone. Note that it's not in any particular order, and I haven't tried all of these apps myself (yet), so check out the reviews, and use your discretion before buying them. Also, I hope to do more posts on this topic (or add updates) in the future, so please leave any recommendations and/or glaring omissions in the comments! Now, without further ado: On to the cats apps! CatPaint promises that you can easily add a slew of kitties - 8 to choose from in all - to any image. 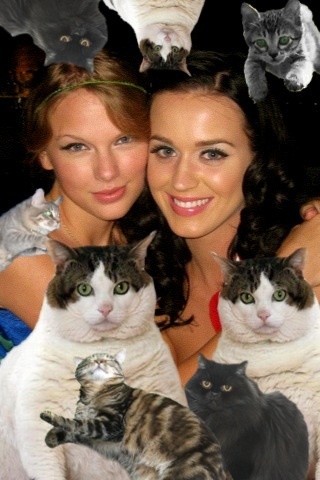 It was brought to the forefront last year by songstress' Katy Perry and Taylor Swift, when the latter tweeted this image of the two palling around, with the caption, "Hanging out with @katyperry is super fun except for the herd of domestic cats that follow her around." Since then, the app has added laser beams coming out of cat's eyes as an bonus feature, and has been adopted by other celebrity users such as James Franco and Kat Von D.
Kitty Wigs comes from Julie Jackson (love her! ), creator and author of "Glamourpuss: The Enchanting World of Kitty Wigs." 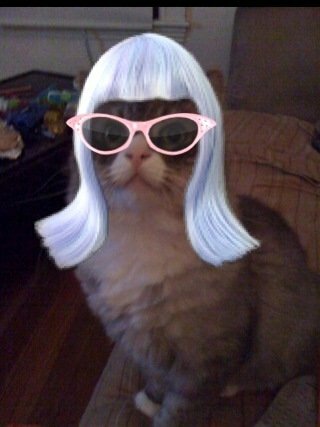 The cute, photo enhancing app allows you to place multi-colored wigs and funky glasses on yourself, the cat, or dog of your choice. I'll be the first to admit that when I saw some of these videos of a cat that repeats what you say and responds to your touch on YouTube, they freaked me out (Ok, they still do). But, Talking Tom still deserves a mention for being one of the most popular applications in the app store, and in fact, Talking Tom Cat 2 is currently in the ranks of the top 25 free apps. It's also worth noting that this week it was announced the maker of the app, Outfit7, signed a deal with Hollywood agent William Morris in hopes of creating books, toys, and more based on the creepy character - He's not going away anytime soon! Fans of the British comic about a misbehaving moggy, rejoice! 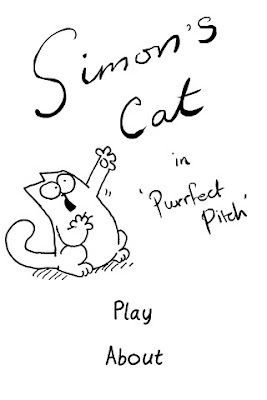 This app is one part musical, and one part game: You can compose your own songs and watch as Simon's Cat sings them back, or play the game to have Simon's Cat test your ability to follow his lead in a series of musical challenges. 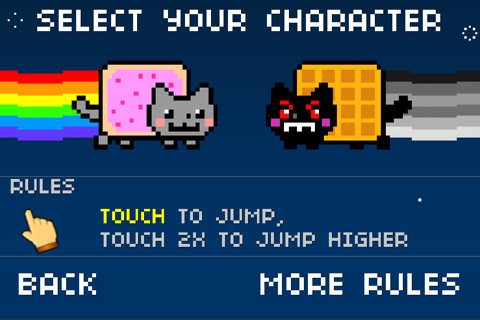 It's still not entirely clear to me what the game is all about, but this "addictive" app has stellar reviews, and features Nyan Cat's doppelganger, Tac Nayn (aka Tac-9), which seems like it would make it worth the 99 cent price tag alone! These two free apps by the cat food giant, the first by any cat food company in general, aim to engage the pet owner, instead of the pet. Studies have even shown that they not only help improve sales, but also have a positive impact on perceived taste of Friskies cat food among consumers (really, people?). Wonderland Quest II is a multi-level game where you must find the hidden game pieces before time runs out, and the recently released Call-A-Cat, reproduces the sound of a popping cat food can, shaking bag of treats, birds chirping, and more, to keep your kitty amused and confused for hours minutes? MewMew Tower is a Japanese game that challenges you to stack as many cats on top of each other as possible, forming a caterwauling tower high in the sky! I first learned about this fun app while doing a Cat Cupcake Tuesdays post back in March, when I found someone who had created cat cupcakes, inspired by the game! Cat Translator was created as an "entertaining and useful tool to help you learn Catspeak so that you can better understand and communicate with your cats." The app comes with a library of English phrases that are translated into meows, that play out loud. Instructions warn against "confusing or stressing out your cat by playing the "angry" phrases while they are nearby." 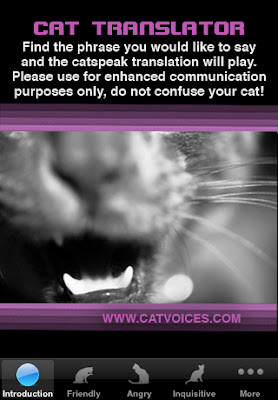 10% of the proceeds from Cat Translator downloads are donated to Kansas City animal shelters and spay/neuter clinics. Create you own meow-velous musical numbers using this app that is exactly what its name implies. One intrepid user even recreated Katy Perry's "Teenage Dream," in part, by using the iPad version of the app. "Digital Photography Never Looked So Analog." 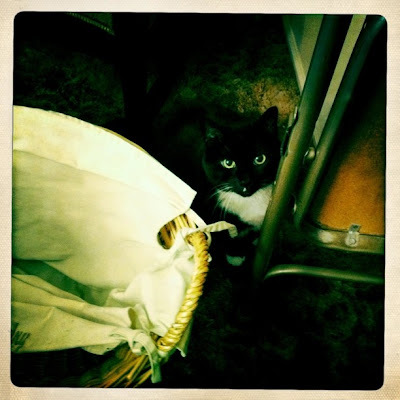 While technically not cat related, the popular photography app is worth a mention for spawning its own single serving Tumblr site: hipstamaticat, where users submit pics of their own cats taken under the app's various old-timey lenses. Here, Priscilla got the Hipstamatic treatment with the default John S lens and Ina's 1969 film. Another similar photography app that's gaining traction in the blogging community is Instagram. The joyously free and easy to use app allows you to take pictures and then pass them through an array of different filters to change the mood and feel of the pic. I took this picture of Charlie and applied one of the filters, and kinda love the dreamy results! The application also enables you to create a profile, post and share your pics Tumblr style (or through Facebook and Twitter), and follow other users updates. In addition, there's also a companion site, instac.at, where you can view an endless stream of cat photos taken with Instagram, at your leisure. Typed from my iPhone (just kidding). 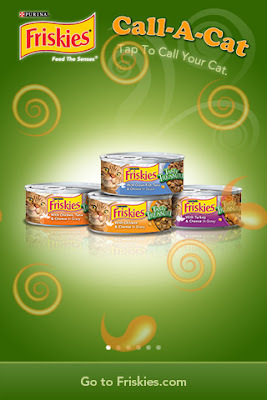 Click here to help us get nominated for Best Cat Blog at The Petties 2011 Pet Blog Awards! Voting ends June 29th! whoa!!! You didn't get the new Android by Sprint that you had featured here?! I am surprised! I have it, got it after I saw it on your blog. FYI I have the Talking Tom and LOVE HIM! Wow, I remember that old Motorola phone. I had one in silver. I still have pics on that phone but cannot for the life of me remember my passcode! I have had the I-phone since last year - I love it. Hope you enjoy yours. You can upload pics and video's onto your blog or FB too! You're gonna have so much fun with it! @Caren I have Verizon, and didn't want to switch! Plus I've been crushing on the iPhone foreverrrr. Also: I'm not sure I could handle a device that's going to help me put "even more cats on the internet"...lol! I hope you're liking yours though! It seems like a great phone! Don't forget "Cat Piano"...where you can play a piano using an array of meows. It drives my guys a little bonkers. P.S. I remember being OVERJOYED about my hot pink Razr when I got it in college. It was the cool thing to have. My iPhone is less than 2 years old, so I was definitey late to the trend, too. Hello! I don't have an iPhone yet, but I have an iPod Touch, and I love it. Thank you so much for all the cat app suggestions! I'm confused and a tad disappointed. I thought you were going to review CAT apps, as in games Iz can play. Mummy bought me this iPad and I'm not thrilled with quality of mouse, rat, spider in the game my sis put on it. They all leave me kind of flat. Mum has the 1st X, she loves it almost as much as me. Ps mum had the exact pink razor, but with Hello Kitty charms. If you tend to have your iPhone charging on your desk or nearby, then the "Fabulous Cat Clock" is a must have! Cats are used for numbers on the clock - and they "chime" in each hour with meows-a-plenty!